BOSâNOVA Plus is a suite of products that provides PC users with AS/400 and SYS/36 connectivity over Twinax. 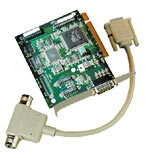 Included in this package are an ISA or PCI Twinax adapter and an assortment of advanced applications for communication between PC's and midrange computers. PC users benefit from immediate Windows functionality for midrange operations based on BOS' rich 5250 display/printer emulation and advanced file transfer applications. The whole system environment gains a powerful boost once AS/400 operations can be offloaded to a PC. Customized for the TDLC environment, the BOSâNOVA Plus 32 provides PC connectivity over Twinax to both AS/400 and SYS/36 hosts. Users benefit from up to four sessions of full 5250 display and printer emulation. BOScom’s on-the-fly GUI application enables a total Windows look-and-feel interface. The BOSâNOVA Plus 32 includes DTF; BOScom’s advanced SQL-based data transfer application. The BOSâNOVA Twinax Client 32 enables PCs and PC printers to interface with midrange systems and perform as enhanced IBM midrange terminals and printers. Users enjoy full Windows APPC display and printer emulation for up to 32 simultaneous sessions. BOSâNOVA on-the-fly GUI application enhances emulation and provides a multitude of features that create a friendly work environment. BOSâNOVA advanced SQL-based data file transfer (DTF) is supported and ready to go with no additional upgrades required. The included internal router provides further benefits for APPC users by enabling the use of compatible applications requiring routers. BOSâNOVA Twinax Client 32 supports IFS 95/98/Me and the SQL file transfer utility. BOSâNOVA Twinax Client 32 enables APPC-connected PCs to function as enhanced midrange terminals. Both connectivity types (APPC and TDLC) support BOS' rich 5250 emulation environment that provides enhanced display and printer emulation functions for a wide range of IBM terminals, including the 3477FC. PC users benefit from full 3477FC emulation including complete color and Text Assist support, DDE and HLLAPI support for integration with Windows applications, and customizable toolbars. Powerful printer emulation capabilities afford a wide range of printing and print management options. Multiple automatic printing modes, complete font control, and customizable printer drivers are just a few of the features included in the BOSâNOVA Plus. BOScom's rich emulation provides a Windows "look & feel" environment. External link enables users to display the contents of a pre-defined file or directory, Web pages, and DTF sites.